All of the goodness and none of the guilt. That’s a win win. Place cauliflower rice on a parchment paper or silicone baking mat lined baking sheet and bake for 12-15 minutes. Remove the cauliflower from the oven and place in a cheesecloth or towel lined bowl to cool until you can handle it. To prepare the garlic base: turn the oven up to 400 degrees F, cut the top 1/4 inch of the garlic head off, and place the top and the rest onto a piece of aluminum foil. Drizzle the garlic with olive oil, wrap tightly in aluminum foil, and roast for 45 minutes or until nice and soft. Once ready, squeeze the cloves into a bowl and mash them together with olive oil and a pinch of salt to create a nice spreadable paste. Boom - best pizza base ever. When the cauliflower is cool enough to handle, you want to squeeze as much liquid out of it as you can. Twist it as if you were wringing out a towel (which is exactly what you are doing lol) until hardly any more liquid comes out. Add the egg, cheese, salt, pepper, and oregano and mix well. Place on a parchment-lined baking sheet or a round pizza pan and form into an even circle - don't make it too thick or thin, the goal should be about 1/4 of an inch. Bake in the preheated oven for 20 minutes, then remove, flip, and bake for another 10. Remove from the oven, top it with the roasted garlic base, and add any toppings you like. We started with fresh mozzarella and since we like meat, we went with chorizo and Polish sausage. Broil until the cheese is nice and melty, remove and eat! I did sprinkle it with a little extra oregano once it came out of the oven for an added aromatic element. I am yet to meet someone who doesn't love pizza. I mean, what's not to like? Crispy crust, melty cheese, and countless possibilities for toppings make this iconic food one of the most popular on the planet. But if you are like me, you also don't feel too good about yourself each time you destroy a slice or two or ten. But what if I told you that you can still enjoy a delicious crispy crust with your favorite toppings but without feeling like a sack of garbage afterward? I am not lying to you, it can be done. My wife and I have recently reevaluated some of our eating habits and discovered that it's the carbs and sugar that kill our model physique (well, duh). 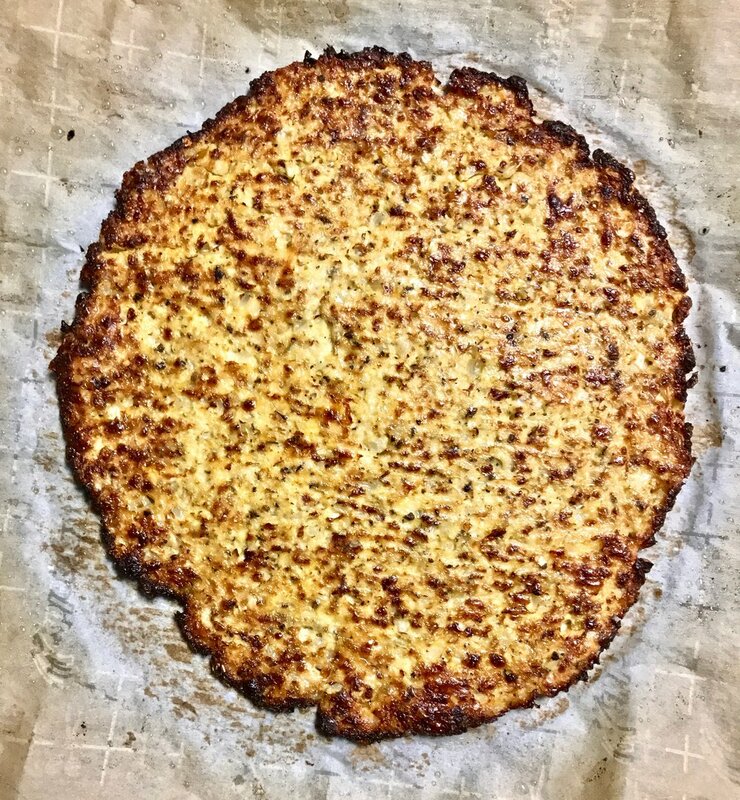 So in our effort to reduce our carb and sugar intake without giving up some of our other favorite foods, I have decided to try this cauliflower pizza. I have seen all bunch of recipes online and recently have noticed even some pre-made crusts in the stores. But here at Kitchen Scratch, the idea of buying a pre-made crust seemed totally ridiculous. Working with fresh cauliflower does require a few tricks, but don't you worry, I am going to walk you through everything you need to be on your way. One thing to clarify - since this crust is not flour based, it won't be like a typical pizza. BUT, it is crispy and incredibly delicious while much, much lighter, and trust me, you are going to feel great after eating. Enjoy!